Veterans who graduated recently from University Without Walls at University of Massachusetts Amherst at commencement. So in the fall of 2016, Oliveira enrolled as a student at the University of Massachusetts, Amherst in a fully online academic program that caters to adult students called University Without Walls (UWW). Now, Oliveira is in the process of taking his last class at the university and is set to earn his bachelor’s degree with a concentration in federal law and criminal justice, a major that he developed with the assistance of his faculty adviser. Drawn to UWW because they were “generous when accepting my credits,” he was able to earn 29 transfer credits from UMass Amherst for his military training and an additional 21 credits for writing and submitting a prior-learning portfolio. Additionally, he says that the program was an “affordable” option. While Oliveira has been working toward his degree, he has found that the biggest challenge has been balancing work, family and school. 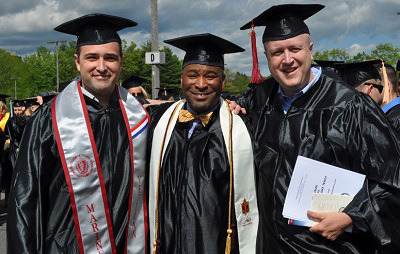 While many institutions around the United States have developed programs for active-duty military and veterans to earn their degrees by providing them with flexible education options, University Without Walls at UMass Amherst has become a national model. Established in 1971, UWW targets adult students in general, but it also has specific opportunities available for veterans or active-duty military, according to Melanie DeSilva, who is the UWW director of marketing, communications and recruitment. Currently, 61 enrolled students have self-identified as veterans, active-duty military or are using family military benefits. Within the UWW program, military students can earn credits two different ways. For one, certain professional training and certification can be transferred for credit. Additionally, students can create the prior-learning portfolio, which is a series of essays that reflect on their life and experiences and students can earn up to 30 UMass Amherst credits. The time it takes students to complete the degree varies as it depends on the number of credits an individual starts with. Students can enter the program with a minimum of 12 credit hours but most students begin UWW with an average of about 60 credit hours. “It is very focused on the individual student and what is going to be best for that student to help them get through the program and earn their degree, meet all of their personal and professional educational goals and help them to save as much money as possible, which is obviously often the case for a lot of folks,” says DeSilva. UWW also helps interested students transition into graduate school. In addition, active-duty military and veterans are given academic advisers that stay with them throughout the course of the program, providing support along the way. “Having that advising support, I think, is absolutely crucial so that when any students are having a challenging time or they are trying to balance everything with work, school, community and family, they have somebody who they can consistently go to for support, encouragement, advice and guidance,” says DeSilva. Some of the challenges that face veterans and active military personnel — such as the financial costs associated with attending college — have been well-documented across the years. According to a report by the American Council on Education (ACE), 42 percent of veterans work full-time while in college. Moreover, 89 percent of veterans applied for financial aid while they were earning their degree and 85 percent of those who applied actually received aid. Sixty-one percent of veterans take classes online, at night or on weekends while only 23 percent of veterans attend college located more than 100 miles from their home. At Craven Community College located in North Carolina, college officials recently launched an innovative program called Lunchtime Learning, which provides military students and their families a flexible opportunity to take classes over their lunch break as a way to work toward their degree. Currently, the program offers a variety of classes including writing and inquiry, writing and research, American history II and general psychology. The course credits can be transferred to a four-year university or be used toward an associate degree. The courses are eight weeks long and occur two days a week from 11:40 a.m. to 12:55 a.m. In the future, Martin says that he hopes to provide students with more course options within the program. Military students have multiple financial aid opportunities in order to help minimize the costs of the Lunchtime Learning program including tuition assistance, which pays upward of $4,500 in tuition costs. Additionally, military personnel who are eligible can qualify for a Pell Grant or other scholarships, according to Martin. In terms of the UWW program, the application fee is waived for veterans and active-duty military. UMass Amherst also offers other campus support systems for military members such as a veteran services office that helps answer questions surrounding affordability as well as the university itself. This article appeared in the September 6, 2018 edition of Diverse, which focused on Veteran Military Education.